I thought I had posted about last fall’s Halloween costume for my granddaughter, but no. Luckily, I had saved a few photos of the finished pieces. She said she wanted to be a ninja (not the turtle variety), so I had to come up with something reasonable—and in blue, her most recent favorite color. 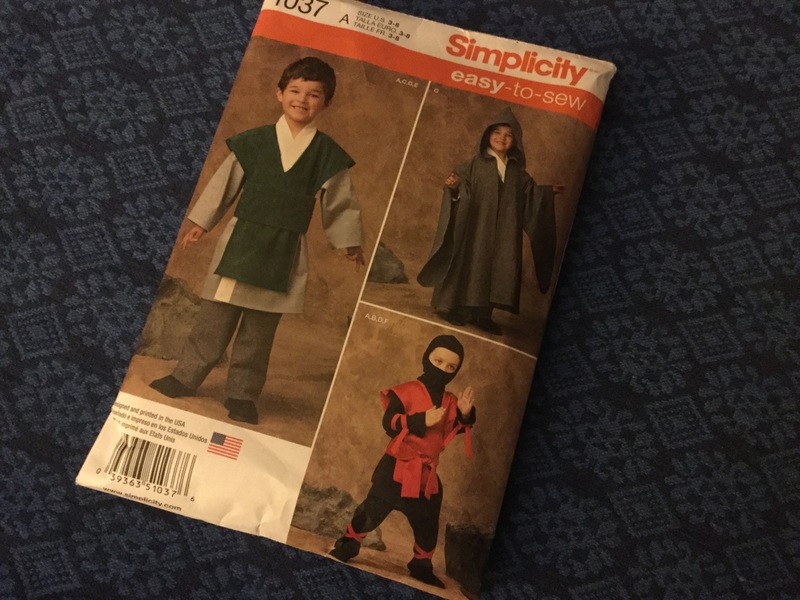 In my mind, the crux of the ninja costume is a close fitting head and face piece, and that’s the one piece I couldn’t make on my straight stitch machine. No matter how many methods I tried, the knit material kept being pulled into the feed and jamming. So that’s the one piece I bought. I know people do sew on knits on their machines, but I haven’t figured it out yet. In my dreams, I would also have a fancy serger. Until then, I just avoid knits. For the rest of the costume, I imagined the typical karate uniform or gi, the loose cotton pants and wrap coat with a tie belt. Who knows, maybe she will want to take such a class and wear it for something other than Halloween. To take the costume further, more into the ninja range, I wanted to make a tabard with some sort of tiger applique, one of her favorite animals at the time. I think the model on the lower right is meant to be a ninja, but I did not opt to tie up the sleeves or pant legs. That just seemed like something too confining for an active 4 yr old (she’s 5 now). The other thing I noticed from the pictures is that all the pieces seem too large for the child model. I wanted something that was a little more fitted. So I shortened both the jacket and tabard to fall just at the lower hip and put side slits in the jacket hem for ease of movement. In addition, I used white binding tape around the edges of the tabard, which makes it stand out nicely. The finished costume looked great with the purchased white knit mask and head covering.